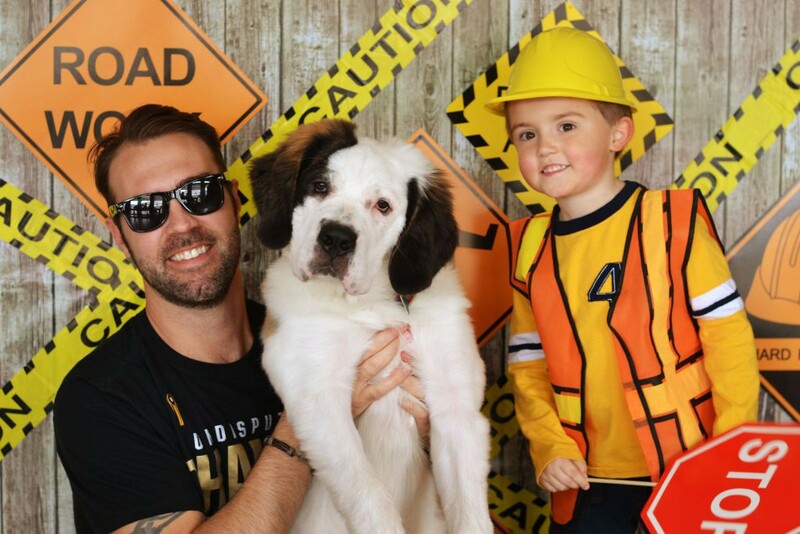 Kids of all ages love a photo booth party! Photo booths have been trending for several years in the party world and they seem to be only gaining popularity lately! If you are looking for a fun activity for kids – and adults – at your upcoming party, a photo booth is a great addition. 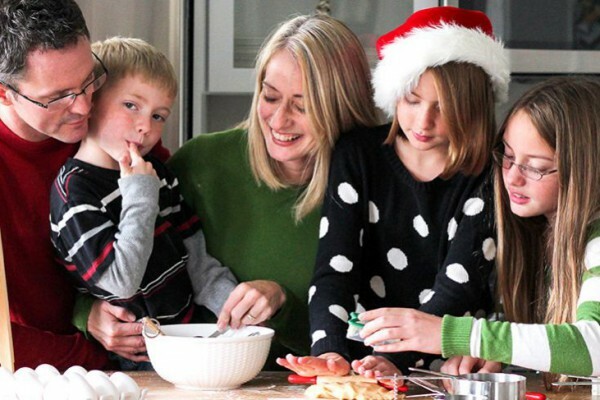 The best part is that it’s really easy, and the kids can keep coming back again and again for new poses and new fun. All kids love making funny faces and posing for the camera! And now, Birthday Express is making it SO EASY to create your own photo booth at home! All you do is pick the theme you like, and they send you everything you need to create an adorable photo booth at your next party. How fun and easy is that? 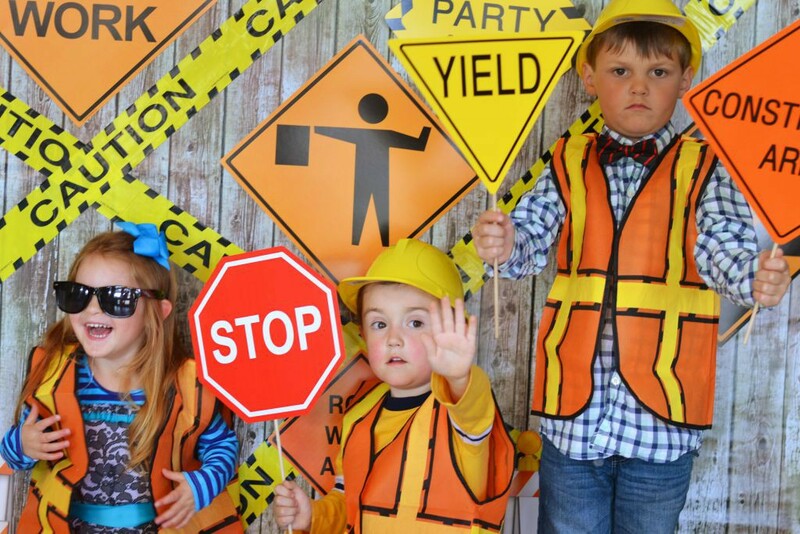 Included in the kits are backdrop materials, photo stand-ins, cut-out additions for your backdrops, wooden dowels to create signs and props with, and even three-dimensional props and costumes for your kids to wear! 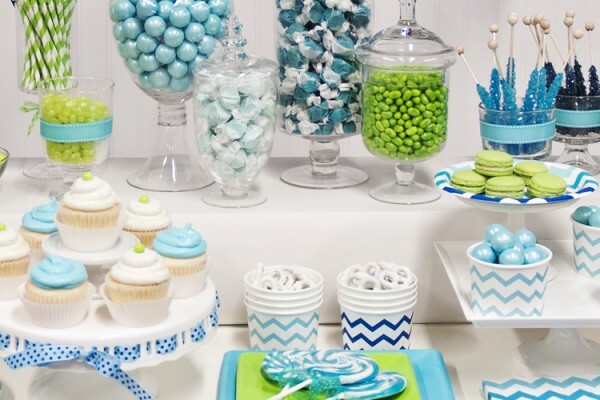 You can also customize the amounts of items in the box for parties large and small. There are 12 different themes for you to choose from, and every one of them comes with all the supplies you need to make it look awesome! 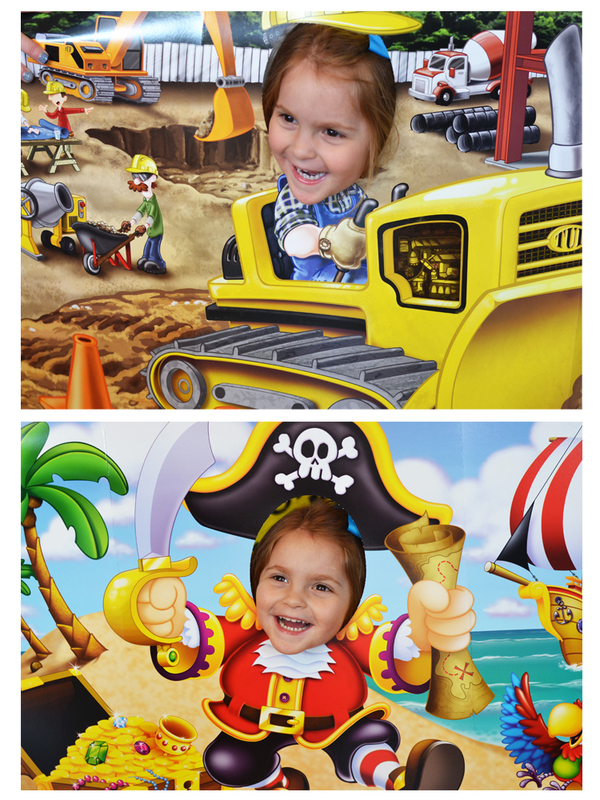 I picked two different themes, construction and pirates, because I knew that my boys would love both. There are themes for girls, for boys, and for both! 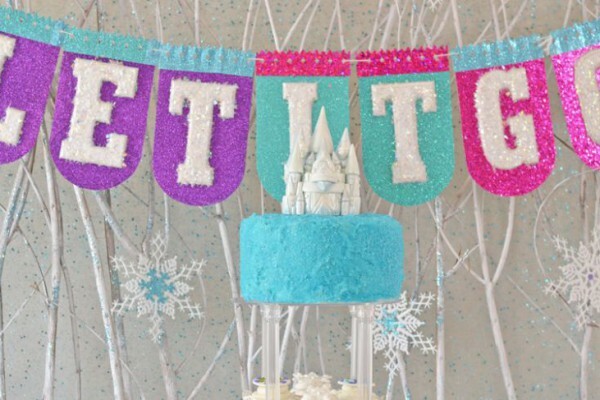 The themes coordinate with all the Birthday Express party supplies, too. 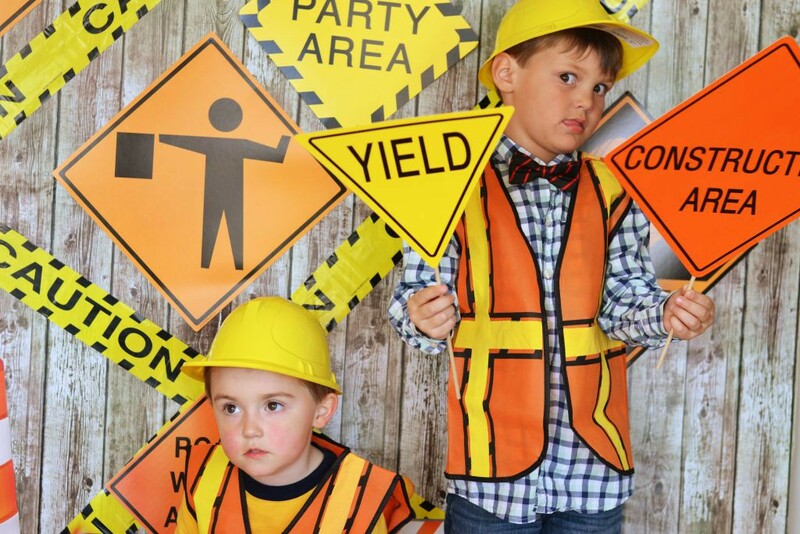 The construction party kit comes with hardhats, sunglasses, and precious orange vests. 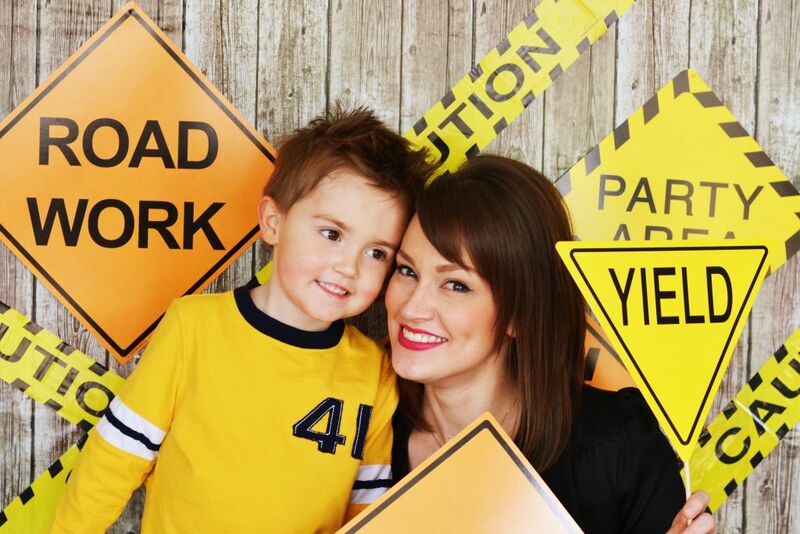 I created my backdrop by using that faux-wood vinyl wall covering and then adding some caution tape and some of the cute road signs. 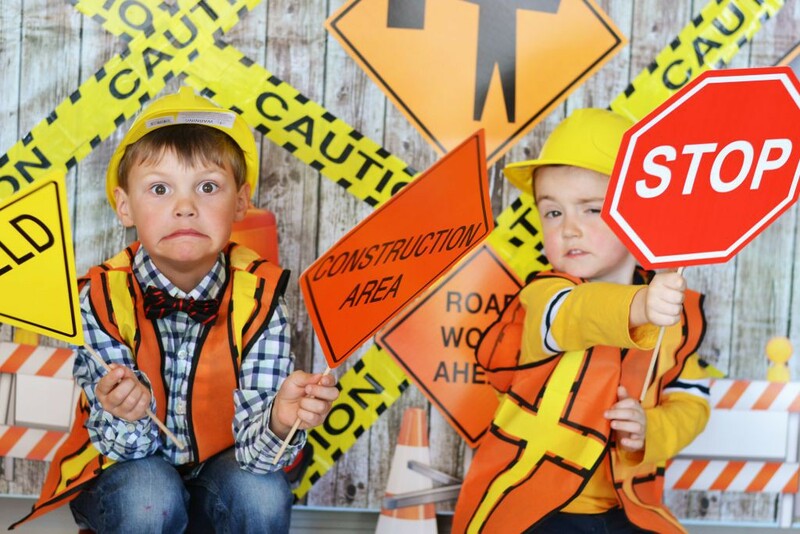 We tried doing our best “Stop” faces and serious construction work poses. 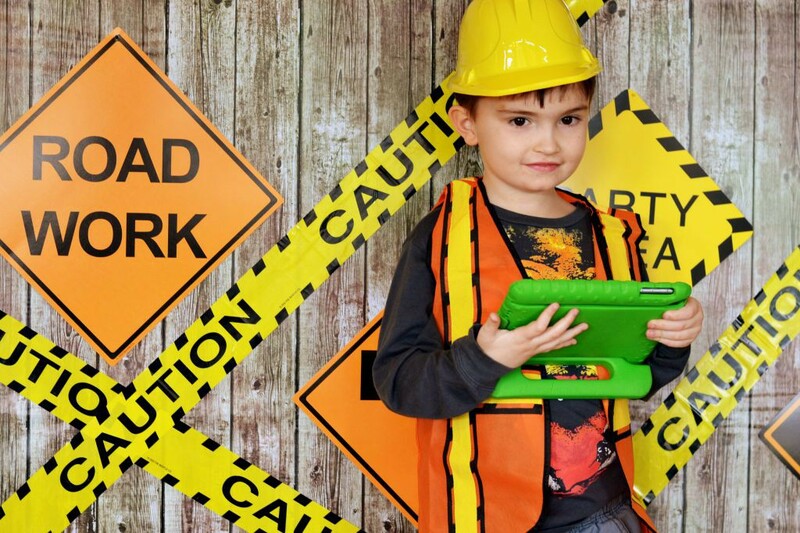 My big guy even posed with his iPad so that it looked like he was doing some important construction business! The pirate kit comes with eye patches (one in pink! ), bandanas, hoop earrings, telescopes, inflatable swords, and fun masks! 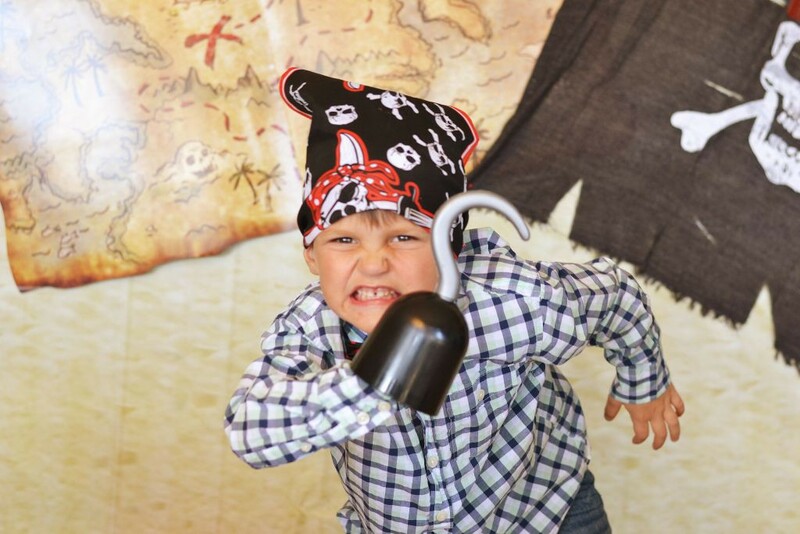 I used the vinyl wall covering that looks like sand and then put up a pirate flag and a treasure map for our backdrop. The kids loved making their best “argggghhh!” faces for the camera! Some of their faces were pretty intense! 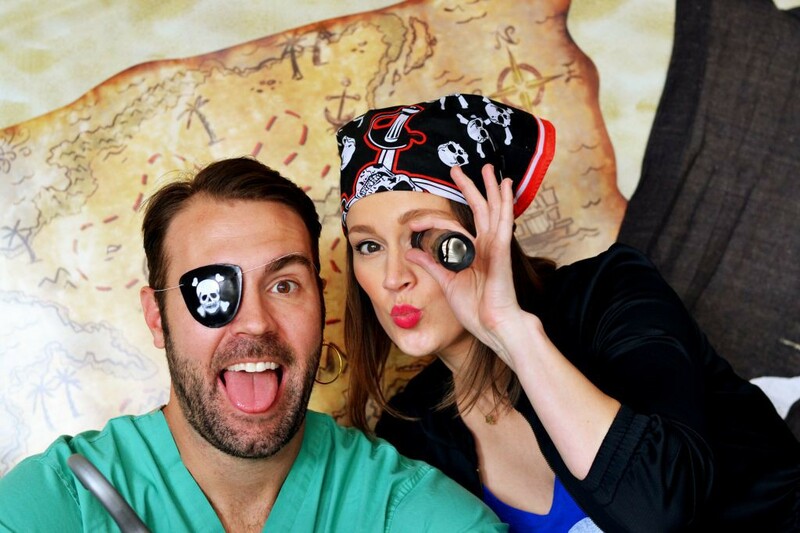 We had a blast trying on all the props and posing! My husband and I did a few shots too. It’s pretty hard to resist putting on an eye patch and a bandanna because they are just so cute! 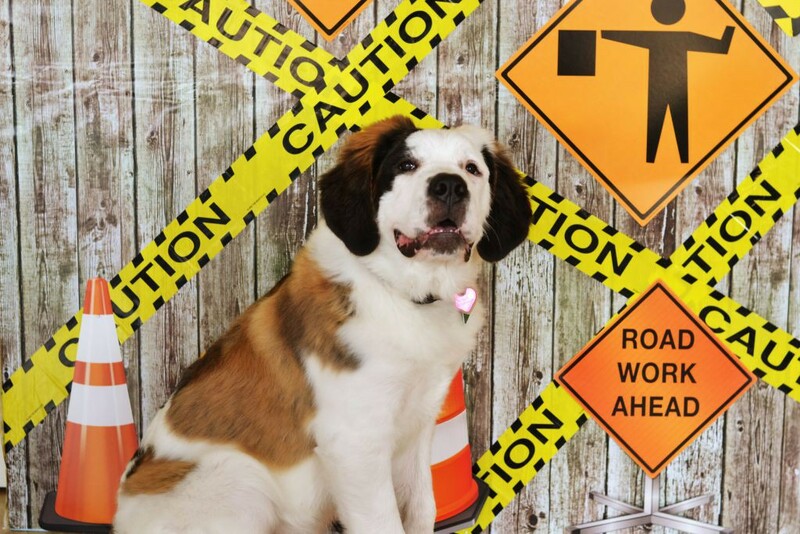 Our St. Bernard puppy, Coco, even got in on the action! She’s a pretty great poser too! The kids could hardly decide which props they wanted to use because there were so many fun ones! And the kids can keep all the props for dress-up later! You also get these great picture stand-ins, so the kids can pose right in the scene! 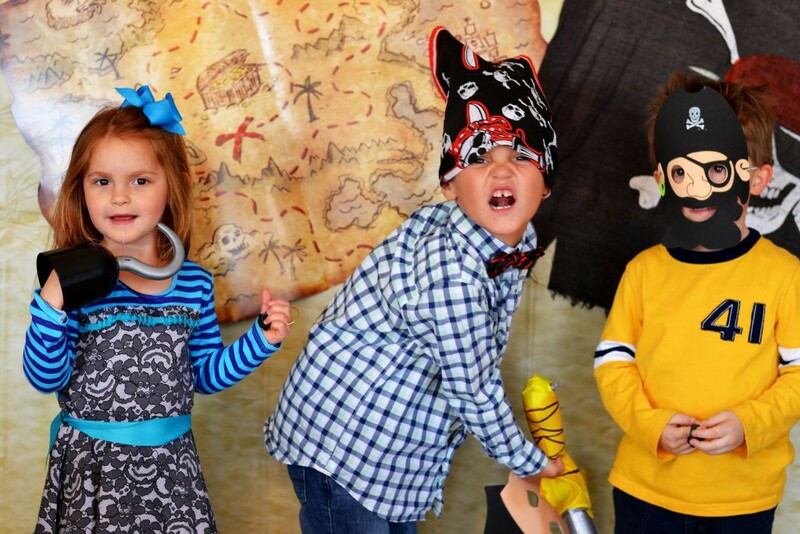 Seeing the kids ham it up for the camera is really fun and makes for awesome keepsakes from your party. 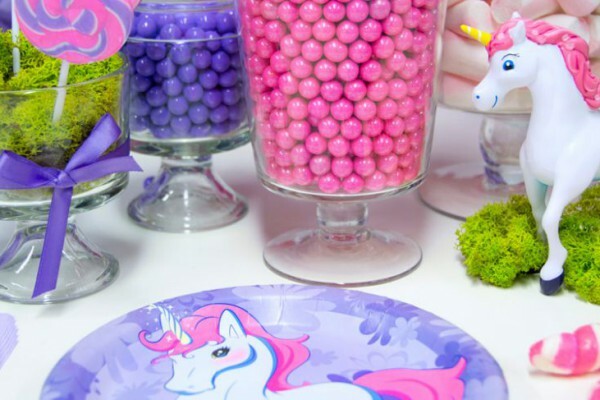 You will absolutely love this kit and it will make your next party so much fun! For some more tips on creating your own photo booth, watch my video about our party! 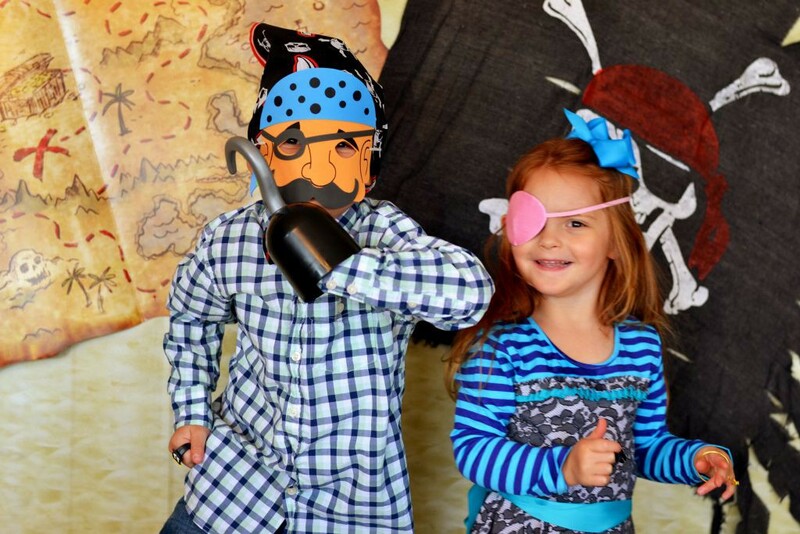 Has Brittany inspired you to throw a photo booth party for your little one? Did you enjoy this post? Want to see more like it? Then follow us on Twitter and Facebook, and tell us what you think! Click here for all our photo booth kits at BirthdayExpress.com! Click here to view more Blue Chevron.